13mm diameter sensor for measuring both temperature and pressure in one device. Measure pressure in ranges from 0-150 psi up to 0-6000 psi. Select a NTC thermistor, PT100 or PT1000 temperature measurement device to integrate alongside the pressure sensing device. If you are looking for miniature pressure transducer, you are already restricted on size, weight or number of sensors you can use. The ASMT combines both pressure and temperature measurement in one tiny package, saving on space, weight and the number of installation points. The temperature sensing component is mounted in the cylindrical part that extends from the thread and is located in close proximity to the process media so that there is a minimal lag in measuring temperature changes. Since there is very little body length to naturally cool the sensor and protect the electronics from high media temperatures, the ASMT electronics are designed to withstand process and ambient temperatures up to 150 degC (302 degF). 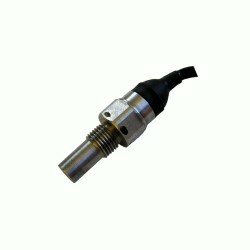 I am looking for a pressure/temperature sensor with a priority being fast response. This would be used to measure water temperature from 20degC to 100degC, what is the response of the ASMT? The response time is 2 seconds. You will need the M10 x 1 male with 5mm temperature tip option to achieve this response time. What is the response time for the output of the ASMT miniature pressure transducer? If it is a millivolt (mV/V) output then it’s <1 msec. If it is an amplified voltage (0.5 – 4.5V) output then it is <5 msec. 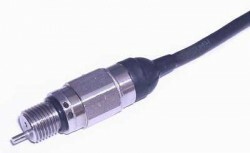 What are the wire connections for the ASMT pressure and temperature transducer with 2 wire PT100 temperature sensor? How is the 1 or 2 wire NTC thermistors option on the ASMT miniature pressure and temperature sensor configured? 1-wire means one end of the thermistor is connected to the 0V (common negative) of the pressure output and the other end is only connected to the other side of the thermistor. 2-wire means that you will have both ends of the thermistor will be isolated from the pressure signal circuit. How is the 5mm temperature tip version incorporated into the ASMT dual pressure and temperature pressure sensor mechanical design? The 5mm tip version has a welded tip on the end of the port rather than being hidden inside an internal cavity, as is the case with the standard ASMT. Where exactly is the temperature sensor located on the ASMT miniature dual press and temp transducer? In the front end face of the pressure port inside an internal cavity. This ensure that it is in very close contact with the pressure media and responds quickly to changes in temperature. 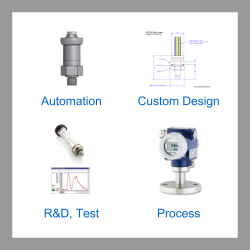 Please select the options you require for the ASMT Miniature Combined Temperature and Pressure Transducer in your application and request a quote. Please enter a number from 50 to 200. Send us your enquiry for ASMT Miniature Combined Temperature and Pressure Transducer to get assistance with this product type.